The FRF Cycling Club is all about community, camaraderie and, er, cycling. We’re a ‘roadie’ club based in New Westminster. See the Rides page for what we’re all about. Or better still, join us and come riding! Regular organized rides and a great chance to put in more miles with some great company. A seasonal calendar of interesting routes and special events. 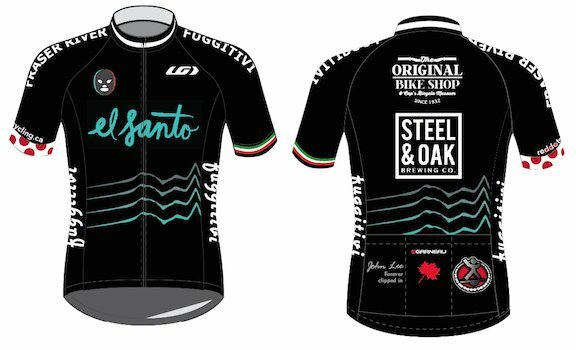 Access to official club kit at very reasonable prices, including custom caps from RedDotsCycling. Membership discounts at our sponsoring bike shop ‘The Original’ in Sapperton. A chance to enjoy post-ride beverages at our sponsoring brewery Steel & Oak in New Westminster. Extra love from our other sponsors Trailside Physio and El Santo. Access to the exclusive Members area of the website and Twitter messages group. Come out and ride with us and meet the rest of the club. Follow us on Twitter (@FRFuggitivi) or email guy[at]le-grimpeur.net for details/questions. If after a couple of rides we’re the club for you, and you’re a good fit for us, supply a few admin details and pay the membership fee ($20 for 2019). We are a Cycling BC affiliated club, so all members are required to have a Cycling BC licence (such as the Provincial Ride licence). See here for all details.